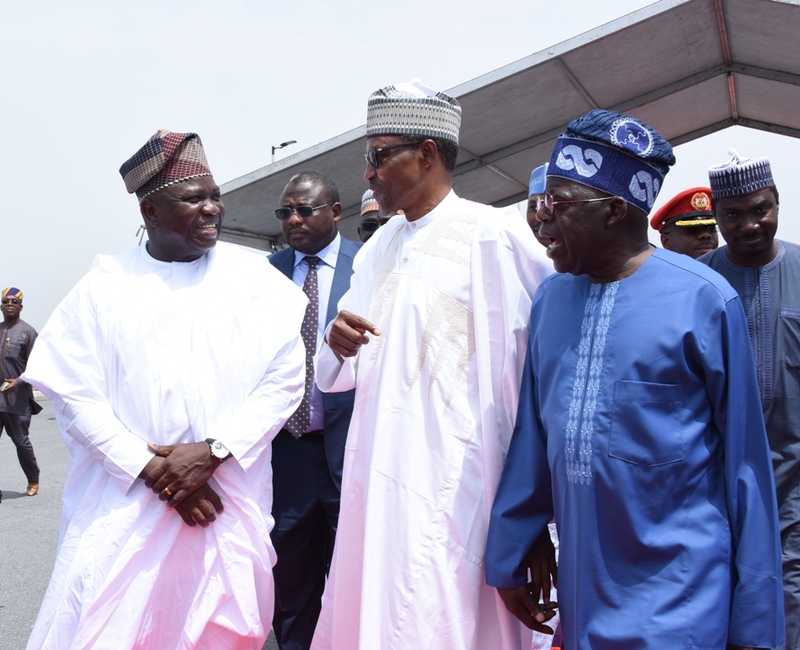 President Muhammadu Buhari (middle); Lagos State Governor, Mr. Akinwunmi Ambode (left) and National Leader of All Progressives Congress (APC), Asiwaju Bola Tinubu (right) during the President’s visit to the Eko Atlantic City, Victoria island, Lagos, on Friday, March 30, 2018. 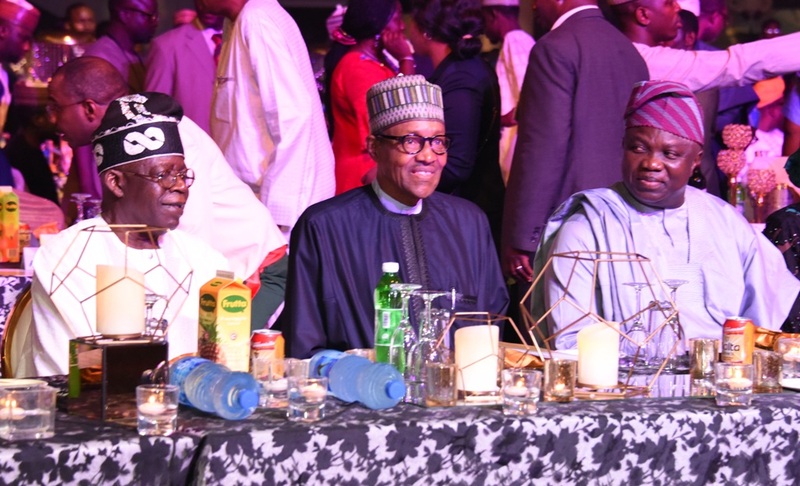 President Muhammadu Buhari (middle), with Lagos State Governor, Mr. Akinwunmi Ambode (right) and National Leader of All Progressives Congress (APC), Asiwaju Bola Tinubu (left) during a State Dinner in Honour of the President at the Eko Hotel and Suites, Victoria Island, Lagos, on Thursday, March 29, 2018. 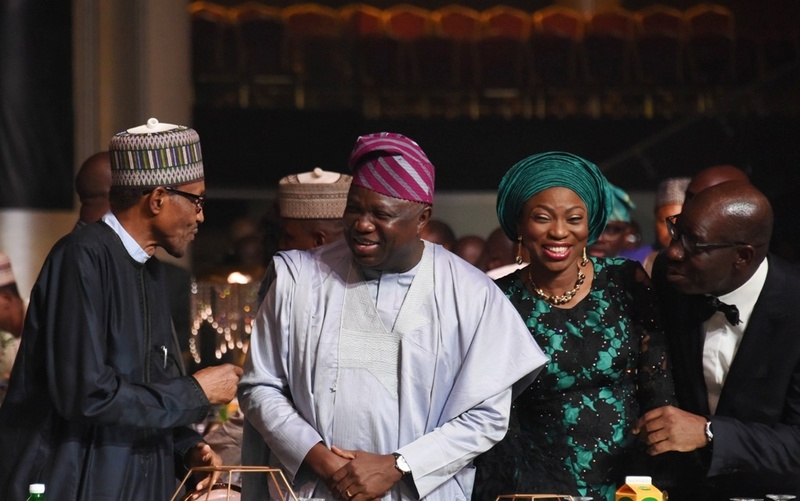 President Muhammadu Buhari; Lagos State Governor, Mr. Akinwunmi Ambode; his wife, Bolanle and Edo State Governor, Mr. Godwin Obaseki during a State Dinner in Honour of the President at the Eko Hotel and Suites, Victoria Island, Lagos, on Thursday, March 29, 2018. 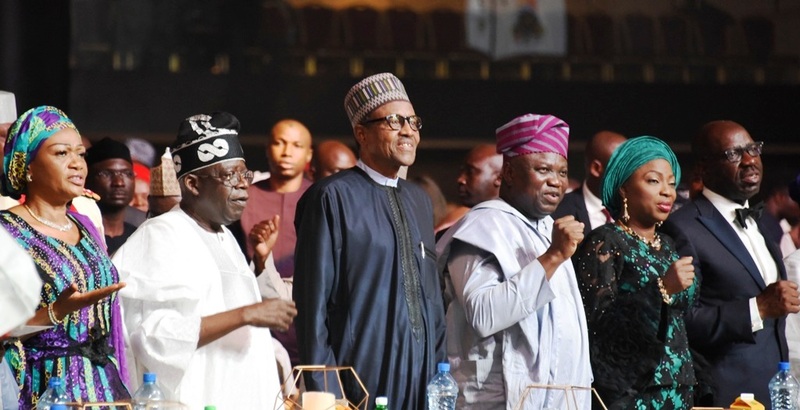 President Muhammadu Buhari (3rd left); Lagos State Governor, Mr. Akinwunmi Ambode (3rd right); his wife, Bolanle (2nd right); Edo State Governor, Mr. Godwin Obaseki (right); National Leader of All Progressives Congress (APC), Asiwaju Bola Tinubu (2nd left) and his wife, Senator Oluremi (left) during a State Dinner in Honour of the President at the Eko Hotel and Suites, Victoria Island, Lagos, on Thursday, March 29, 2018. 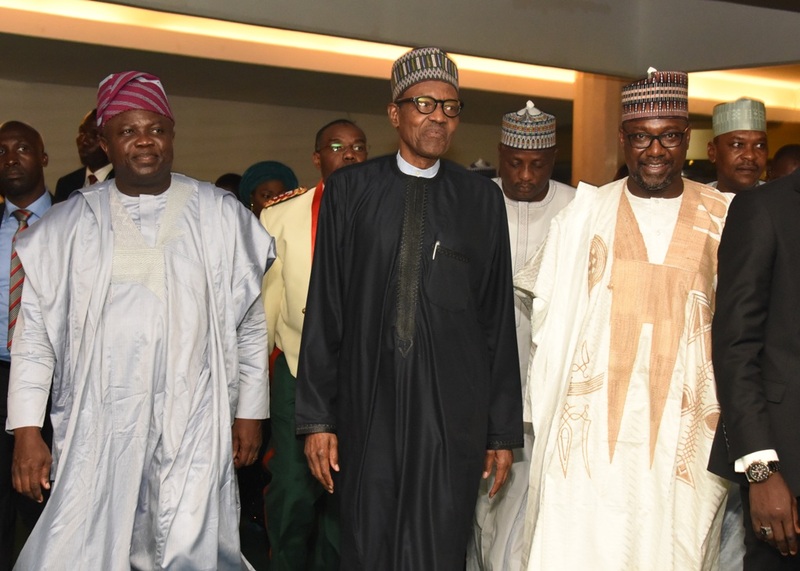 President Muhammadu Buhari (middle), with Lagos State Governor, Mr. Akinwunmi Ambode (left) and his Niger State counterpart, Alhaji Abubakar Sani Bello (right) during a State Dinner in Honour of the President at the Eko Hotel and Suites, Victoria Island, Lagos, on Thursday, March 29, 2018. 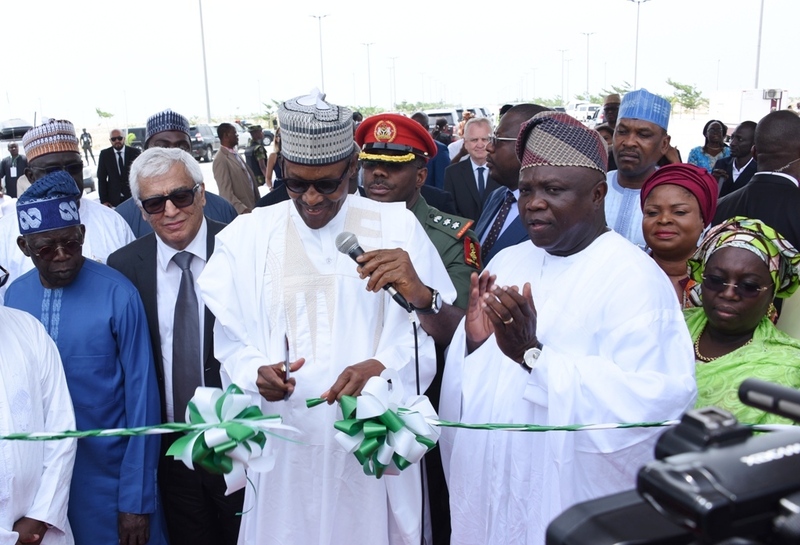 President Muhammadu Buhari (middle); Lagos State Governor, Mr. Akinwunmi Ambode (2nd right); his Deputy, Dr (Mrs) Oluranti Adebule (right); National Leader of All Progressives Congress (APC), Asiwaju Bola Tinubu (left) and Chairman, Eko Atlantic City, Mr. Ronald Chagoury (2nd left) during the President’s visit to the Eko Atlantic City, Victoria island, Lagos, on Friday, March 30, 2018. 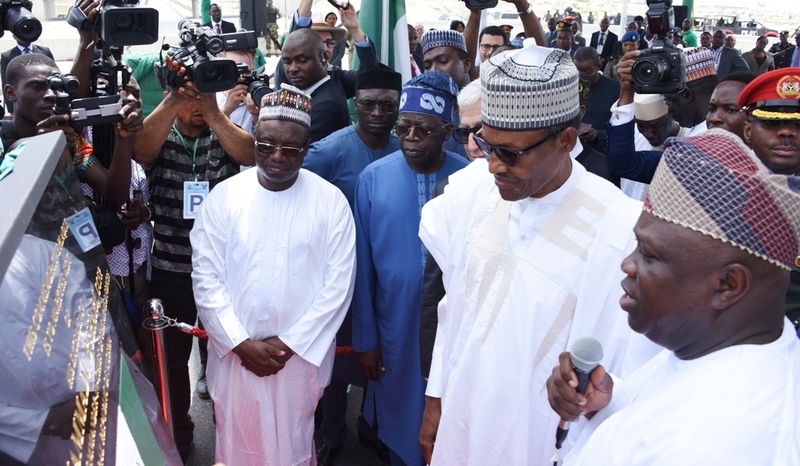 President Muhammadu Buhari (2nd right); Lagos State Governor, Mr. Akinwunmi Ambode (right); Chairman, Eko Atlantic City, Mr. Ronald Chagoury (3rd right) and National Leader of All Progressives Congress (APC), Asiwaju Bola Tinubu (4th right) during the unveiling of the plaque to commemorate the President’s visit to the Eko Atlantic City, Victoria island, Lagos, on Friday, March 30, 2018.